We are pleased that you have made the decision to locate your offices here. The Democracy Tower Tenant Guide has been designed to provide you and your employees with general information, procedures, and policies which will assist you in operating your business at Democracy Tower. 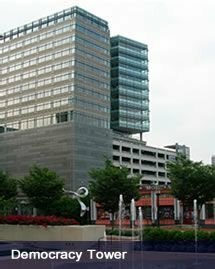 Located seven miles from Dulles International Airport off Reston Parkway, Democracy Tower is in the urban core of prestigious Reston Town Center, a 1.8 million square foot mixed use complex of office, specialty retail, dining, cinema and hotel facilities. This 8-story Class A office building is one of the tallest in the area with excellent visibility and panoramic views. The property features a street level lobby, street level retail, a sky lobby and is positioned on top of a 9-level parking structure.